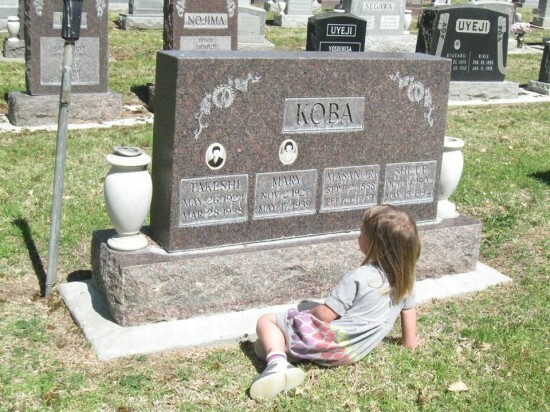 A Gosei (great-great-grandchild of Japanese immigrants) stops in the Old Japanese Section of Mount Hope Cemetery to contemplate the portraits of children who died as before World War II. SAN DIEGO — The Japanese American Historical Society of San Diego invites the public to the dedication of the Issei Memorial Bench on Monday, May 27, at 9:15 a.m. during the Tri-Church Interfaith Memorial Day Service at Mount Hope Cemetery, 3751 Market St., San Diego. Conceived, funded and built by JAHSSD as a tribute to San Diego’s first generation of Japanese immigrants, the marble bench will offer respite to those visiting grave sites in the so-called Old Japanese Section of the cemetery, where many Issei are buried. The two-sided bench, located near the Japanese American Veterans Memorial Monument and flagpole dedicated by JAHSSD in 2005, includes a memorial plaque on its surface and two permanent vases for flower offerings at its base. The annual Memorial Day Service is hosted by Asian Pacific Post 4851, Buddhist Temple of San Diego, Pioneer Oceanview United Church of Christ, and San Diego Japanese Christian Church. For more information on JAHSSD, visit www.jahssd.org/.